Written in response to the New National Curriculum for years 4/5, this resource is designed to help support teachers in the precision teaching of grammar and punctuation skills. Containing games and activities linked to the New National Curriculum, written specifically to develop children’s writing skills. The games are designed to be used discretely at the beginning of a literacy lesson. By teaching these key skills, children will become more alert to the construction of sentences, giving them the skills to use grammar and punctuation confidently and independently. To make the games and activities fun throughout this two book series, children will meet two key characters: “Inspector Grammar” and his faithful companion “Punctuation Pooch”. 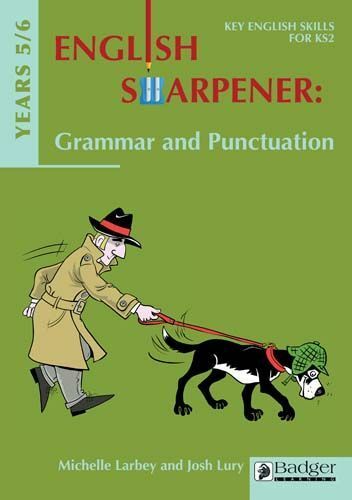 Inspector Grammar will help them to inspect their own writing and become more confident with their grammar work made explicit in the New National Curriculum, and they will have fun with Punctuation Pooch and his extra sensitive nose to sniff out particular punctuations.